When we start routinely jacking into The Matrix, won't the jack be Ethernet? Will it be an RJ-45 in your ear? It's hard to overestimate the importance of Ethernet to networking over the past 25 years. When Network World started, the technology had been around a while, but in the last 25 years we have seen Ethernet come to dominate the industry. It has outlasted Token Ring, ATM, FDDI and other competing LAN technologies. It has extended from the LAN into the wide area and wireless realms. Through technologies like switching and QoS controls, Ethernet has become the foundation technology for most networking communications today. 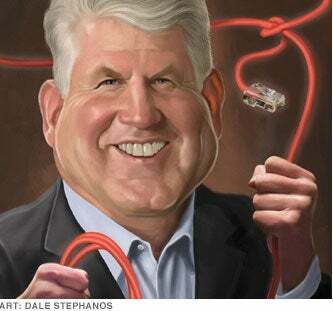 Bob Metcalfe invented Ethernet in 1973 while at Xerox PARC, and the company patented it in 1975. Metcalfe and others then finalized an open Ethernet standard in 1980, and by 1985 it had become an IEEE standard. An industry was born, and Ethernet was ready for its meteoric rise. Metcalfe has been a key player in the industry since, founding network powerhouse 3Com in 1979 and working as a venture capitalist. Late last year, he took a position as Professor of Innovation and Murchison Fellow of Free Enterprise in the Cockrell School of Engineering at the University of Texas at Austin. Do you have a sense of how important Ethernet is to the world? If you count Wi-Fi (first called wireless Ethernet by IEEE 802), and I do, something like a billion new Ethernet ports are shipped every year, I think. I bet you could get a better number from IDC. Ethernet is the Internet's plumbing. How important is the Internet? Without Ethernet we'd be stuck with the old AT&T telephone network, and you remember how slow that was. No, I do not get $1 for every Ethernet port. I do get to tell bellhops in hotels that I invented that wire on the desk, and they say, "Sure you did." Did you ever have an "a-ha!" moment while developing Ethernet? Ethernet was invented on May 22, 1973. There have been many a-ha! moments over that time. One big a-ha! was in the office of DEC's VP of engineering in February 1979. Gordon Bell asked me to invent a new LAN for DEC, since Xerox owned the patents on Ethernet. But since I had already invented the best LAN I could think of, I declined. But then one of us (we can't recall which) said a-ha! let's DEC and Xerox work together on making an open Ethernet standard. I drafted the letter for Gordon, Xerox said yes, and I found Intel after that, and by June of 1979 there was the DEC-Intel-Xerox (DIX) Ethernet standard in the works. So I founded 3Com Corp. on June 4 to serve the coming Ethernet-compatible market. Actually, 3Com was founded to pursue initially three coming standards: Ethernet, TCP/IP, and Unix. Three for three, which is why 3Com hit $5.7 billion in 1999 and as of 2010 is now part of HP. Little did I know what I was getting into. Did you think Ethernet would have the impact that it has? No. At Xerox PARC we were building our own tools. We were building the first laser printer to get better listings - at 500 dpi and a page per second, do the math. And we were planning to put a computer on every desk - the Xerox PARC Alto Personal Computer -- so we needed what would much later be called a LAN. I lucked out and got a problem nobody had ever had before -- a building full of PCs that needed high-speed connection to a laser printer and the Internet (known as ARPAnet then). What is the most unexpected or surprising use of Ethernet that you've come across? I recently ran into a young aerospace engineer who told me he was finally going to get Ethernet into the F-16. Or maybe the Ethernet ports on some of the robots in Dean Kamen's FIRST Robotics Competition? And when we start routinely jacking into The Matrix, won't the jack be Ethernet? Will it be an RJ-45 in your ear? What technologies do you think will be important in the future? We are going to use the Internet/Ethernet to disrupt, for the good, these three industries in which such disruption is long overdue: energy, healthcare and education. The important technologies will be above the Internet's plumbing. Smart grid architecture and standards. Energy storage. Medical records architecture and standards. Scanning and sequencing for personal medicine. Architecture and standards for eliminating school buildings and replacing them with socially networked teaching and learning systems.